Ward Farms of Whitsett has been continuously growing for several generations, dating back to the late 1800's. We started out primarily growing row crops of corn, oats, wheat, rye, soybeans, tobacco, and livestock. We researched other farming possibilities after leaving tobacco production in the late 1990s. 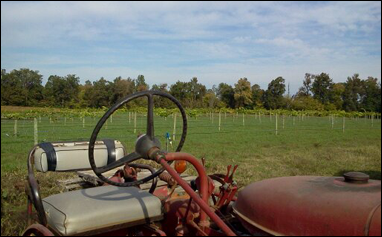 After deciding to become a more diverse farm operation, we found the soil here at Ward Farms of Whitsett was great for the muscadine grapes. Not only do we have rich soil for theses particular crops, but here in Central North Carolina the temperatures are perfect during the growing season. Also, there is a high demand for fresh vegetables, so we made it a priority here at Ward Farms to produce fresh seasonal vegetables such as green beans, squash, tomatoes, okra, peas, peppers, etc. All of our specialty products are available on Amazon.com for your convenience.